Would you not require one such amplifier per pixel? I thought valve amps throw off harmonics as they reach saturation... hence the lovely tonal depth? Does that mean that a saturated blue pixel will start bleeding over to green output? how would that be wired? Point to point with EL-34s I hope. // into a 32 bit depth pixel // I'm feeling a bit inadequate with my 512x512 pixel 16 bit camera. Harmonic distortion can be pleasant with an audio signal, but with a picture aren't we just be talking about noise or graininess? 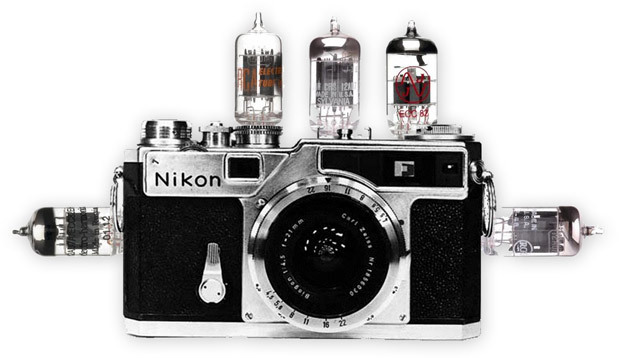 The idea of a tube camera does sound very steam- punk cool. Instagram have proven that point, no? I propose a more direct solution, a massive grid of photo- multipliers. I reckon we can get a reasonable photograph out of something the size of a truck. camera power measured in megawatts, not megapixels.